Metcalfa pruinosa on unidentified tree trunk. Note the adult on the right side of the trunk. Video grab courtesy Zach Davis. These poor insects. Stuck with a name that sounds pretty boring–even to an entomologist. And the scientific name is little better: Metcalfa pruinosa is a type of planthopper, a relative of the aphids, scales, whiteflies, and leafhoppers. It belongs to the family Flatidae, hence the name flatid. And it is found on citrus, but also lots of other plants. For some reason, these little insects seem to be pretty abundant this year, so you may be more likely to see them in your garden. They may show up on various trees, orchard and citrus trees, grape and other vines, shrubs, and even herbs. The main thing that would draw your eye to this otherwise obscure insect, is the waxy, flocculent excretions of the nymph, similar to the flocking on a Christmas tree. Among the fluffy wax you can usually find the pointy nosed nymph, and sometimes the grayish to purple-colored adult. Infestations originate from an adult that lays its eggs inside the stems of host plants the year before. Nymphs hatch in March-April, and take close to two months to develop. There is reportedly only one generation per year, and adults are most commonly seen now, in June. Adult Metcalfa pruinosa are 5-8 mm-long. Their presence confirms the identity of this species in wax accumulations. Photo via Bugguide, courtesy Sean McCann. Metcalfa pruinosa is not a pest to worry about in your garden. Damage they might do to plants is almost always negligible–though they have been reported to damage buds of freeze damaged citrus, and may cause sooty mold deposits on leaves, in heavy infestations. If you see waxy colonies of this insect on your plants at home, you probably do not need to do anything. However if their numbers become troubling, try knocking them off the plant with a stiff stream of water, or spray lightly with some insecticidal soap or horticultural oil. Keep in mind that planthoppers like Metcalfa may be confused with mealybugs or some forms of scales or aphids that also produce a waxy bloom. Metcalfa wax is lightweight and fluffy and often restricted to the stems of trees, shrubs and vines. The nymphs, if disturbed, will jump–further distinguishing them from mealybugs and aphids. 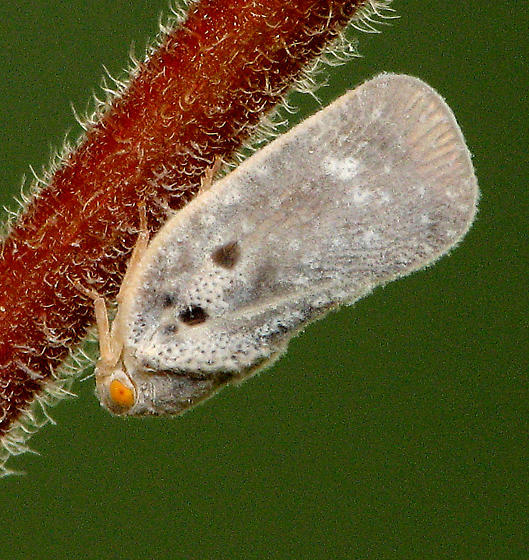 This entry was posted in Interesting insects and tagged citrus flatid planthopper, Metcalfa pruinosa, planthopper, waxy insects. Bookmark the permalink.